Tina Hacker, unlike many writers she knows, didn’t start composing poetry in elementary school. It wasn’t until she was a sophomore in college that she wrote her first poem. A struggling music major, she knew she had to make a change, but she didn’t want to give up “doing something creative.” So she changed majors and started to write. Her college friends liked her first poem and second and third, just the kind of encouragement she needed. Tina filled every available minute writing poetry between classes, before meals, and during football games. Five minutes here, twenty minutes there, a blissful hour leaning against a tree. Within a year, she had been published in two university literary journals. A Pushcart Prize nominee, Tina was a finalist in New Letters and George F. Wedge competitions. Her work has appeared in numerous journals including Bellowing Ark, Blue Unicorn, Kansas City Voices, Coal City Review, Mid-America Poetry Review, Little Balkans Review, The Kansas City Star and Touch: The Journal of Healing where she was featured as Editor’s Choice. Her work also appears in anthologies: Missouri Poets, Show + Tell, Imagination & Place: Ownership and In the Black/In the Red: Poems of Profit and Loss. Tina serves on the Board of Directors and is the immediate past co-president of The Writers Place in Kansas City, Missouri. Writing poetry enables me to focus on creativity. It helps me meet and learn from other writers, near and far. I can’t think of anything better. The greatest gift we can receive from a literary work occurs when the writing portrays such truth that it resonates at our core. Of the many forms of writing we encounter, poetry faces the challenge to reach us on such a deep level simply because of the brevity of the form, so when we discover a poem that rings with truth we tend to take notice. My introduction to Tina Hacker's poetry came late in July of 2009 in the form of an email containing poetry submissions to our literary journal, Touch: The Journal of Healing. I was captivated by the empathy and insight into the truth of the human condition that was portrayed by the characters in the poems. As a result, Tina's poems were selected as our Editor's Choice collection for the September 2009 issue of our journal. I was delighted to eventually receive and ultimately select a manuscript from Tina which contained a broad selection of her work. One evening, after several telephone conversations with Tina, I was reviewing her poems when my eyes settled on the cover art of Tina's book, "Tension," a charcoal portrait created by the artist, Lynn Norton, Tina's husband. I became captivated by the portrait and as Tina's writing began to fill my mind, I heard a voice speak two hushed words, my life. The voice grew in intensity until it began to toll with the clarity of a bell through the crisp clear air of a cloudless winter morning. Tina's collection began to take on new meaning as I considered how her writing reflected the stories of so many people who have faced adversity, have been damaged by it, but ultimately have risen above the challenge to survive, to cut it. In the end, I chose poems that were multilayered and spoke to the human condition. Cutting It reveals the lives of people from our country during the past 60 years, and how their lives were influenced by the past. You will learn about people like Pearl and Helen who conceal their heritage, about damaged souls like David and Ellen, about prejudice and fear and growing older, but ultimately you will learn how the bonds of families preserve our own existence and how influences from our past steer our future. The tolling of Cutting It is far reaching. On the surface, it reaches through time, back through generations of Jewish immigrants. It also reaches forward in time towards their future. And, if one is open to the depth of the work, it reaches beyond time, beyond race, beyond religion, and beyond even geography because it speaks of the struggle for survival of humanity as a whole by remembering the lives of individuals along the way. It speaks to us all. In this collection, Tina Hacker has shown a cast of survivors that have learned through life’s situations to “cut it,” to be tough-minded, to eke out a life whether suffering the wounds of prejudice or cancer. Lydia, Pearl, Ellen, Helen, and the unnamed voices of these survivors come alive through strong narrative and vivid imagery. Their stories of counting peas during the depression, finding swastikas on poker chips, or “listening to cicadas/struggle against their dying,” are vivid and powerful. Hacker brings to life those that others think are doomed for their beliefs, those that need to “hide inside a shadow” never knowing “when [they] are safe.” These characters learn to move through the world despite the odds. Hacker gives the reader much to think about, feel, and enjoy. Voice is the key element at play in Tina Hacker’s Cutting It. Sure and insouciant, that voice flies in the face of life’s frequent, bewildering messages of death and decay. Hacker shakes a fist at God in poems presenting a paradox of no-nonsense tone coupled with lush imagery. In poems of biting irony and humor, she warns us of the danger and menace stalking our lives. To read Cutting It--especially “Where the Chips Fall” and “Nothing Serious”--is to experience a poet in full control of her craft. 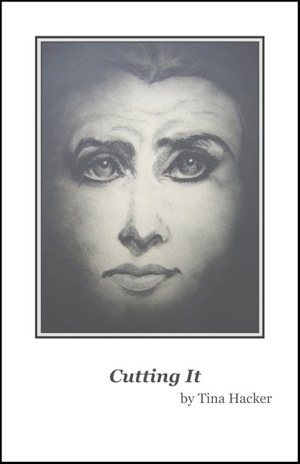 Cutting It is a collection of character driven poems illuminating Tina Hacker’s Jewish Heritage. She portrays the fragility of the human condition and the emotional toil extracted from lives of people faced with an imperfect world. Written portraits introduce you to a child who “hid inside a shadow”, a cousin who holds onto “unspoken words”, and a boy’s grandfather who “with large blunt fingers slapped / the dust of madness / off his shirt and pants”. When this poet said, “another world is opening”, you will understand how she came to be the woman she is today. She honors those who came before her with artistry and craft devoted to moments in lives that opened and closed, lives that mattered. Judith Bader Jones author of Delta Pearls and Moon Flowers on the Fence. Like Pearl in the poem, “Unaccented,” Tina Hacker has perfect pitch. Her language is spare and precise, and yet rich with sensory memories. We hear European accents straining to become American, smell whiffs of cigarette smoke and Gefilte fish, feel lace between our fingers, hear prayers and slaps, see “home” through other people’s eyes. With quick side glances, she hints at terrible things, but then directs our eyes toward courage and to the intimate ways in which generations love and fight and try to understand one another. These are poems of carefully observed detail, honest stories of pain, laughter, beauty, and the conflicting human desire to hide and yet be fully seen.